Health informatics is the science behind the convergence of healthcare, information technology and business. The practice of health informatics deals with the storage, retrieval, sharing, and optimal use of data that relates to human health, and it considers how we use this knowledge for problem solving and decision making. Health Informatics underpins a nation's ability to deliver an affordable, flexible health system that will provide better health outcomes to citizens. Based on international trends, the NZ health sector needs to be ready to support further changes in communication technologies, portability, genomics, and telehealth. In addition to managing the changing public expectations of access to their health information. Health informatics is about much more than technology. For example, you may use technology to collect the data, and you might store the data in a computer, but health informatics is more concerned with what you do with the data after you have collected it. When and how is it shared? When is it kept private? How do you read and translate the data? 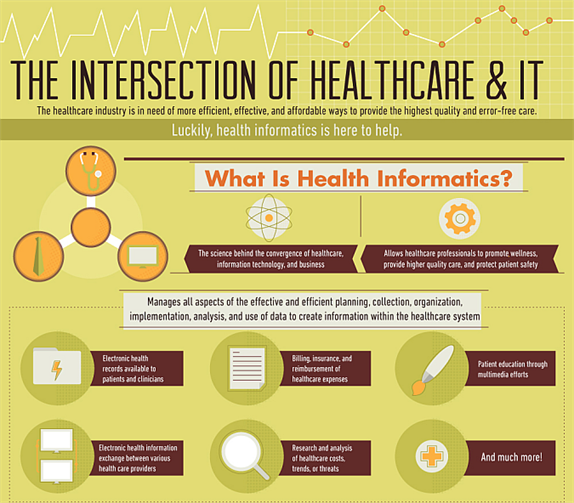 Health informatics is one of the fastest growing areas within healthcare. To achieve the Government's eHealth vision, New Zealand will need many more health informatics practitioners, now and in coming decades. View a list of university courses. View a list of online courses. Find out about CHIA certification. So what is the best way to create a health informatics expert? Do you teach a person working in the health sector about IT? Or do you teach an IT person about health care? The short answer is we need to do both. If we are to be successful in designing effective solutions to transform the health sector, New Zealand needs health sector experts who know about technology - and technology experts who know about health. To learn more about career opportunities in health informatics and build your network within an active community join HiNZ today. To search and apply for jobs visit the HiNZ career centre.